Hi, Tom Jacoby, Number One On The List. The reason Number One On The List is here is to help you to improve search engine results. Whatever your product or service is, if you have a cheeseburger restaurant and somebody does a search for cheeseburger in your location…let’s say, it’s Hicksville. So somebody searches Hicksville cheeseburger, cheeseburger Hicksville, anything like that, you want to come up on page one. You want people to find you and not your competitors. That’s where we can help. If you’re ranking right now but you’re on page three, you get overlooked, we can get you on page one. 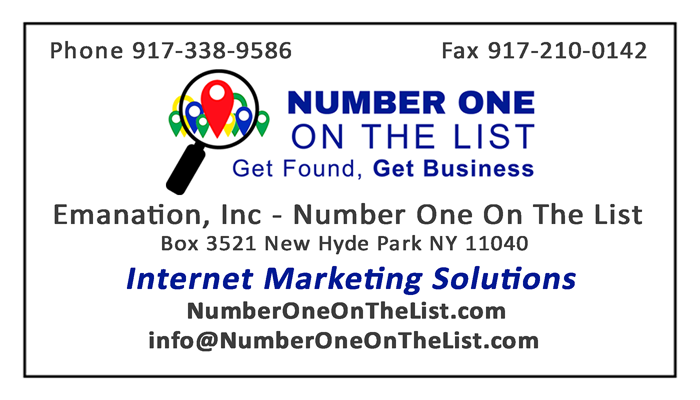 We can improve your search engine results. We were incorporated in New York in 1997. We have a lot of experience with this and we’d be happy to share what we’ve learned with you. Send me an email. Give me a call. Let’s talk.